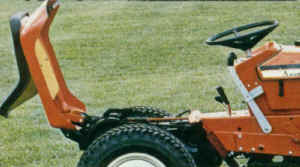 700 series garden tractors . . . get attached to one of our compacts and get big things done . . . fast. 16 H.P. 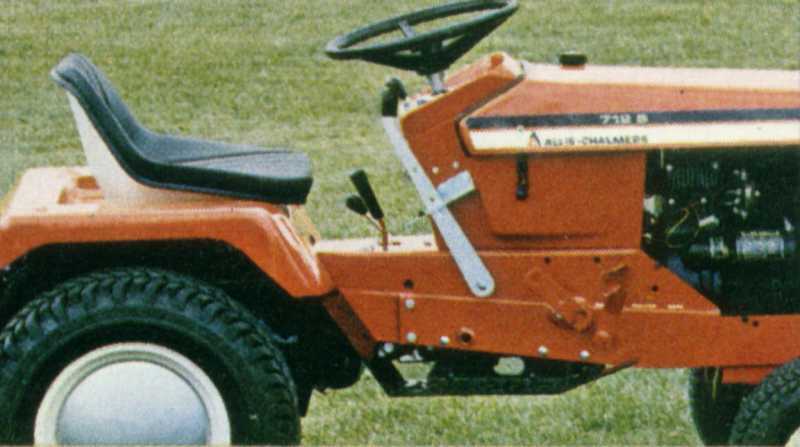 Kohler air-cooled engine; electric start; interlock safety start system: center PTO; manual lift; drawbar; tilt-up hood; brakes; beadlock rims; fuel gauge; ammeter; contour seat; dual headlights; hydrostatic drive. 12 H.P. 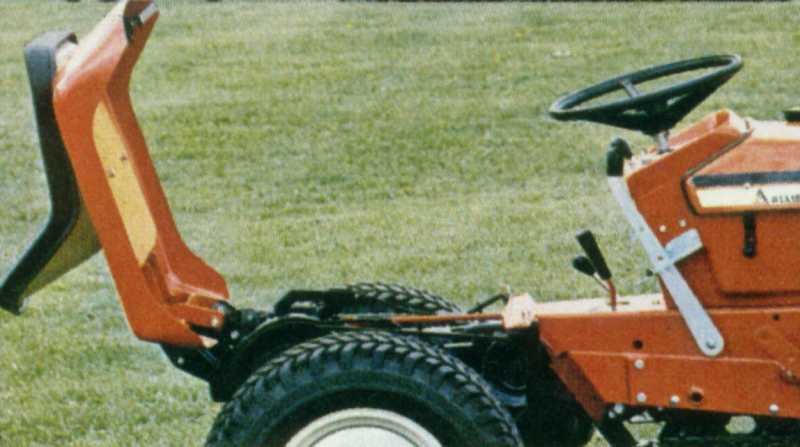 Kohler air-cooled engine; electric start; interlock safety start system; center PTO; manual lift; drawbar; tilt-up hood; brakes; beadlock rims; fuel gauge; ammeter; contour seat: dual headlights; hydrostatic drive. 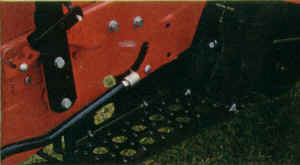 Front = 16-6.50 x 8. HYDROSTATIC SYSTEM (716 & 712) . . . infinite control of speed and forward/reverse changes without clutching. 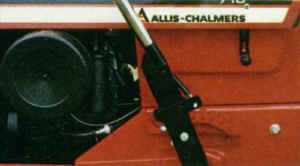 Manual bypass system so the tractor can be moved with the engine off. Hydrostatic unit is mounted integrally with the differential for extra cooling area. Automatic bypass for fast cold weather warm-up. 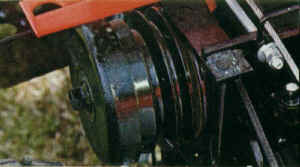 Soft ride valve bypasses hydraulic surges to smooth out driving action under sudden demands of tilling and shock loads. FLOTATION TIRES . . . wide rear tires on beadlock rims add comfort... reduce skidding and scarring on tight turns. 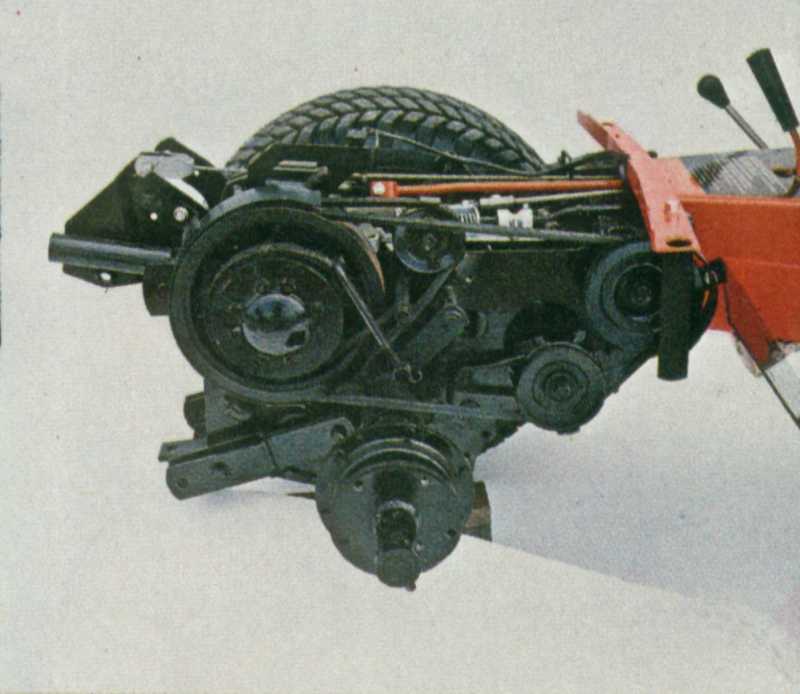 Automatic traction system ... one wheel drives if the other slips. BALANCED ENGINE . . . single cylinder air-cooled engine is dynamically balanced horizontally and vertically to reduce vibration for day-long driving comfort. Tilt-up hood for all-around accessibility. KEY STARTING . . . just as easily as your car. High capacity 12volt battery and fully regulated charging system deliver. 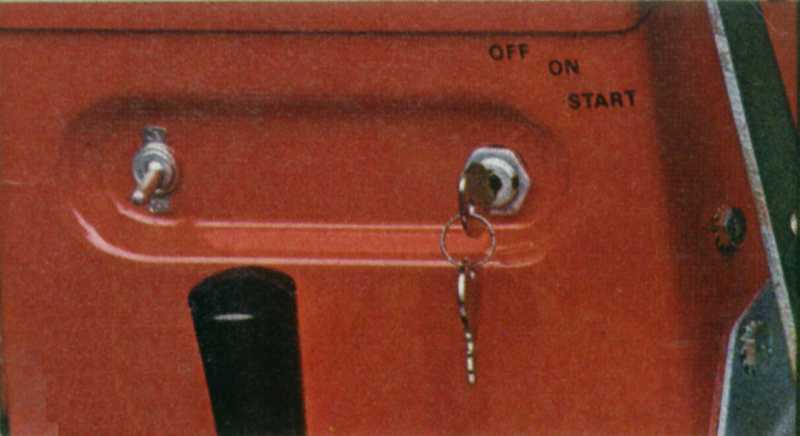 Interlocks prevent accidental starting. TILT-UP SEAT . . . just unlatch and the full seat deck swings up for easy access to transmission area. Deluxe seat is mounted on rubber cushions. Adjusts to suit your size and reach. SHUTTLE DRIVE . . . semiautomatic transmission through four forward ranges and reverse. 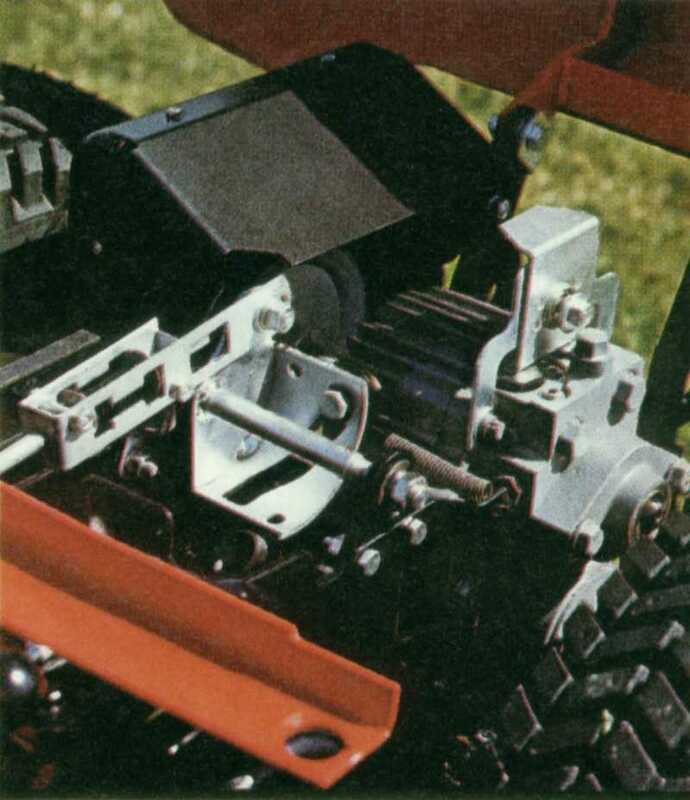 One lever changes direction without shifting gears or clutching or changing engine speed. FULL-LENGTH FOOTRESTS . . . no more muscle cramps from stirrup-sized footrests. You can stretch out or sit upright to suit your mood or manner. Open, non-skid surfaces are easy to clean. FRONT, CENTER, REAR PTO . . . lets you handle just about any kind of power-driven attachment in its class . . . that's total flexibility for the way you use your 700, and how often. MANUAL LIFT . . . mounted on the left frees your right hand for accurate steering during lift! lower sequence. Action Is natural ---forward to lower, back to raise. Right hand dual lift lever option. TRANSMISSION . . . is an integral part of the tractor design, not an adaptation of an assembly-line-produced general purpose unit. Rugged, hardened gears.., tough cast-iron gear cases. Planetary final drive. 12 H.P. Kohler air-cooled engine; electric start; interlock safety start system; center PTO; manual lift; drawbar; tilt-up hood; brakes; beadlock rims: fuel gauge; ammeter; contour seat: dual headlights; semiautomatic transmission; 4 speed ranges-forward and reverse. 10 H.P. 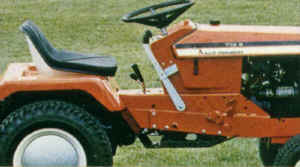 Kohler air-cooled engine; electric start; interlock safety start system: center PTO: manual lift: drawbar; tilt-up hood; brakes: beadlock rims; fuel gauge; ammeter; contour seat; manual shift 3-speed gear transmission (1 reverse). Front = 4.80/4.00 x 8.